IndustriALL Headlines are written by IndustriALL Global Union. Sep 19, 2014 – In an unprecedented move, eight major fashion retailers have said they are prepared to pay more for clothes made in Cambodia. It follows a global day of action by unions in support of garment workers’ demands for a higher wage. 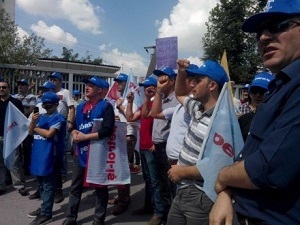 Sep 24, 2014 – IndustriALL Global Union’s Turkish affiliate Petrol-Is keeps campaigning against wild union busting engaged by pharmaceutical manufacturer Deva Holding. The count of the dismissed workers reached 24, sacked simply for signing up with the union. Deva Holding is a Turkey-based pharmaceutical company, however EastPharma Ltd., established in 2006 and incorporated in Bermuda, is the indirect holding company of Deva. The investment firm GEM (Global Equities Management) owns about 65% of EastPharma while about 15% of the company is publicly traded along with 15% of its Deva Holdings subsidiary. Such complicated ownership structure has rebounded negatively onto labour relations. As a matter of fact, four years ago, the company management used different tactics to demolish a 40-year-long union existence, contractual labour relations and mature social dialogue with Petrol-Is at Deva Holding plants located in the production facilities located in the provinces of Tekirda?, Kocaeli and Istanbul. At that period, Deva management had announced that there would no longer be a collective agreement using the pretext of high production costs and government policies in the pharmaceutical industry. They had exerted pressure on workers to sign individual labour contracts in place of the collective agreement and then dismissed 70 employees because they had refused to sign individual contracts. The local labour courts have ruled that Deva terminated employment contracts of the dismissed workers on unjustified grounds and all of them must be reinstated. However not one sacked worker has been able to return. Over the years, working conditions for Deva workers have deteriorated with low wages, insufficient social benefits, continuous threat of dismissal, mobbing, unsafe and unhealthy working conditions. In June this year, an overwhelming majority of Deva workers started to re-join Petrol-Is. However the answer from Deva Holding was again harsh with dismissals. The 24 dismissed workers were simply exercising their legitimate fundamental rights to freedom of association, guaranteed by international labour conventions of the ILO, as well as Turkey’s Constitution and national trade union legislation. “We have lost our patience. Don’t forget that we are a 50-million power,” said Kemal Özkan, Assistant General Secretary of IndustriALL Global Union, in a recent demonstration held in front of the premises of Deva Holding in Istanbul. “Deva cannot stop us in defending our rights. They will sign the collective agreement, otherwise we will challenge them wherever they are”. EastPharma claims that it wants to be the place where east meets west. It also intends to open more plants and obtain FDA (U.S. Food and Drug Administration) and European Medicines Agency (EMEA) certification for its manufacturing facilities. 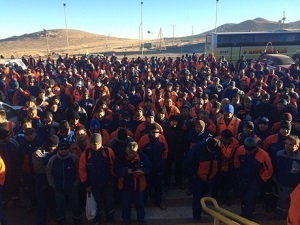 Earlier this year, IndustriALL Global Union approached the CEO of Deva Holdings urging the company to immediately re-instate the eight dismissed union members; withdraw all pressure exerted over the union members; and enter into constructive dialogue with Petrol-Is since the workers have a legitimate and legal right to choose their unions freely. Click here for more information. As the company is unresponsive, even escalating it’s anti-union campaign, IndustriALL Global Union has launched an electronic campaign in cooperation with Labourstart for re-instatement of the dismissed workers and recognition of Petrol-Is. Please join. Sep 22, 2014 – IndustriALL Global Union expresses its deep concerns about recent developments in Kazakhstan after the Criminal Code and the Code of Administrative Offences was adopted in July this year limiting freedom of trade union activities. Coming into effect as of 1 January 2015, these acts opened the possibility for the government bodies to intervene in trade union activities, while restricting the possibility of strikes, meetings and street protests.As a matter of fact, at the beginning of September 2014, the Confederation of Free Trade Unions of Kazakhstan (KSPK) has submitted to the Committee of Experts of the International Labour Organization (ILO), a critical analysis of the newly adopted national law “On Trade Unions”, seriously limiting the opportunities for trade union movement of the country. Already at the stage of consideration as a bill the law “On Trade Unions” was gravely criticized by the international trade union movement and the International Labour Organization. Despite that the law was adopted by the Parliament of the Republic of Kazakhstan in June this year. The review makes a detailed analysis of the articles of the law related to the freedom of internal trade union activities, such as the ability of trade unions to define own structure, put forward demands and realise their right to strike as well as the problems regarding the union registration by the state bodies, reorganization and liquidation. In particular, the law makes it difficult to exercise the union right to push forward demands to the employer and to strike. In accordance with the law the sector trade union should be established by not less than half of the total number of employees or organizations in the industry, or should have structural subdivisions in more than half of the regions, cities of national significance, as well as in the capital, which can lead to even greater trade union monopoly at the enterprise and sector level. “This recent legislation is very worrying and appalling, particularly when it is coupled with earlier happenings” said Kemal Özkan, Assistant General Secretary of IndustriALL Global Union. “Kazakhstan is a critical country for the jurisdiction of our global union, and we will continue to give support democratic unionism in the country”. Sep 25, 2014 – IndustriALL invites affiliates to participate in the discussion of the Initiative for Responsible Mining (IRMA) released for public consultation. The ground-breaking draft standards are developed within the framework of the multi-stakeholder approach and governance of the initiative, which allowed equal representation of mining, workers, indigenous communities, NGOs, downstream users/business. Since the 1st world summit on sustainable development (Rio+10) in Johannesburg, South Africa in 2002, almost every sector of the global industrial economy has seen a proliferation of global standards claiming to abide by imperatives of Sustainable Development. Together with the United Steelworkers, IndustriALL has been involved in an effort to create higher independent third-party standards and verification systems for almost eight years since the time when ICEM (IndustriALL predecessor) participated in the second meeting of the Initiative for Responsible Mining (IRMA) in 2007. IndustriALL Global Union and the USW are members of the IRMA steering committee. The development of standards require two public consultations and review periods. The release of the current draft is the first public review and consultation period that will end on 22 October 2014. A second public review and consultation will open immediately following the collation of the comments, input and feedback by the IRMA steering committee. After the standards are adopted, next step will be to set up on-site verifications systems, which must engage workers and community members directly and qualitatively to assure that the adopted standards are being implemented. 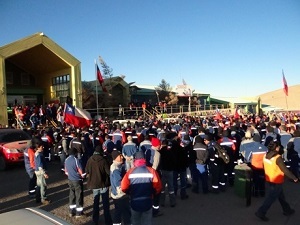 Sep 25, 2014 – Workers at the Escondida mine and its port, Coloso, in Chile, went on strike at 8am on 22 September after members of Union Number 1 voted to stop work in response to the constant violations of Chilean law by the mine’s multinational owners, BHP Billiton and Río Tinto and the Chilean authorities’ failure to make the companies comply with the country’s legislation. The union said: “this strike is a warning and is our response to the failure of talks with the company and the authorities to make any progress”. The strike lasted 24 hours, but as the company made no practical proposals, workers went on strike again at 8am on Wednesday 24 September. Mass meetings at 8pm on Sunday 21 September and on Monday morning for workers leaving the night shift (shift D) were followed by a march by workers on both shifts through the mine’s installations. Jorge Almeida, IndustriALL Regional Secretary, wrote to workers at Escondida before the strikes, supporting their struggle and demanding respect for their rights. The union called on the company “to take responsibility for the issues that led to the strike within a reasonable time frame and find a mutually advantageous solution to problems for which the company is entirely responsible”.